Inner light, soul’s code, spark of the divine, true self. Whatever words may strike a chord and speak to your heart, the journey on finding, trusting, and using your voice is inside-out work of a lifetime. 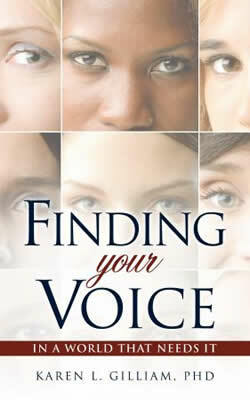 Finding your voice is not the destination; it is a manner of traveling as told through the story lens of my journey. Sankofa. Use the thought-provoking questions to revisit and re-claim your past; to reflect and reminisce on the present. Explore what it means to be faithful to your true nature. Find and use your voice in a world that needs it; for no one else can dance your dance, sing your song or write your story. To purchase a signed copy, click on the Buy Now button. The following is an excerpt from the chapter entitled “ON LEARNING: What do you fear?" Life has given me questions that only I can answer. What difference will I have made by being here? Will my voice be that of optimism and cheer? Will I take what I’ve learned and pass it on to the next? Will my zest for living and loving never be at rest? Will my voice speak for the voiceless, the powerless, the few? Will I have been a role model and shown how-to? Will I exercise my voice for truth and reason? Will I become more of who I am with each succeeding season? Will I have carried as I climbed? Will my tithe be in treasure or perhaps in time? Will my voice respect the inner teacher? Will beautifully sung songs be one of its features? Will I have fought a good and just fight? Will I be the answer that comes to light?